GAME THREE 2000… Slaughter at Stadium Australia. One team scored over half a century of points, while the other barely cracked one seventh of a century of points. In other words - New South Wales slaughtered Queensland by 40 points at Stadium Australia in Game Three of the 2000 State of Origin Series. NSW had already won Games One & Two of the Series to reclaim the Origin Shield but Game Three in front of nearly 60,000 fans wasn't going to be easy. Actually it turned out to be easier than easy. Ryan Girdler had a field day - breaking record after record in the State of Origin arena - picking up 32 points and the Man of the Match Award in the process. Queensland had been edged out 20-16 at Stadium Australia in Game One but were dominated 28-10 at Suncorp in Game Two... but still nobody expected a 40 point deficit - even for a dead rubber. For a game that featured 12 Tries & 72 points - we didn't have a single point until the 16th minute. In the 16th Minute - NSW scored first when QLD replacement Julian O'Neill (on for an injured Ben Ikin) threw a careless cut out pass inside his own half aimed at Wendell Sailor. But Ryan Gidler read the play beautifully and snatched the ball and raced 40m to score untouched. Girdler converts; NSW 6-0. In the 19th Minute - NSW extended their lead to two converted tries when Brad Fittler presented Adam Muir with a lovely short ball from 10m out. Muir's try came off the back of NSW finding the QLD edge defenders out to get deep into QLD's half and then Fittler mesmorised Gorden Tallis & Julian O'Neill to send Muir between them. Girdler converts; NSW 12-0. In the 23rd Minute - Queensland took advantage of a spilled Darren Lockyer bomb by Tim Brasher - as Mat Rogers sneaks past some lazy Brasher clean up work to score. Rogers converts; NSW 12-6. In the 26th Minute - NSW score through Girdler again after a Brett Kimmorley bomb is not contested by QLD and Adam MacDougall kicks it on the half-volley - Lockyer recovers the ball in his in-goal but Kimmorley's tackle jolts it free and Girdler pounces! Girdler converts; NSW 18-6. In the 30th Minute - Queensland keep pace... albeit briefly. Adrian Lam puts a bomb up that Matt Sing & Wendell Sailor contest with Adam MacDougall. Sing recovers the ball first and finds Darren Smith who shows a clean pair of heels to beat the cover defence to score in the right corner. Rogers misses conversion; NSW 18-10. In the 37th Minute - NSW slot a penalty goal after Tim Brasher is taken off the ball by Darren Smith following a Brett Kimmorley chip kick. Ryan Girdler makes no mistake with the Penalty Goal; NSW 20-10. NSW's lead could have only been four points at halftime had Andrew Johns' not stopped Paul Bowman on the line after a great Adrian Lam cut out pass. Joey had been good in the first half but come the second half - his genius was about to be on full display. At halftime the score was NSW 20 leading QLD 10. The Blues had dictated terms in the opening forty minutes but the Maroons weren't letting them out of their sights quite yet. NSW's big men had rolled over the advantage line at will and despite some gallant efforts in the QLD pack - they couldn't contain it. The second half would leave no doubt whatsoever as to who owned the 2000 State of Origin Series. In the 44th Minute - NSW re-asserted their authority with a a brilliant try. A classic State of Origin team try went as follows. From halfway it went from Johns to Kimmorley to Hill to Fletcher to Ainscough to Kearns to Furner to Fittler who found a gap on the left edge drew the fullback and sent Andrew Johns over next to the sticks. Girdler converted; NSW 26-10. In the 52nd Minute - NSW extend their lead to 22 points when Ryan Girdler grabbed his hat-trick after an Adam MacDougall steal. With the QLD defence backpedalling - the class of Brad Fittler picked the right man on the left edge to send Girdler outside the defence untouched. Girdler converts; NSW 32-10. In between the flurry of NSW tries - Tim Brasher tried to shape up to Tonie Carroll = mistake. And in the 56th minute Wendell Sailor knocked on off a Scott Hill grubber, much to Ray Warren's chagrin: "Wendell's made a mistake!" In the 58th Minute - NSW are blowing the score out now when Brad Fittler exposes the frail QLD edge defence by sending a glorious long pass to Matt Gidley who scores in the right corner. Girdler converts; NSW 38-10. In the 65th Minute - NSW score again this time through backrower Bryan Fletcher. It starts with Brett Kimmorley and Brad Fittler combining to send Tim Brasher through a gap and the fullback finds Fletcher who scores under the posts - triggering the now famous 'hand grenade' post-try celebration. Girdler converts; NSW 44-10. In the 71st Minute - NSW crack the half century when Brett Kimmorley crafts a try for Adam MacDougall on the left. The QLD defence makes a poor read on Tim Brasher's decoy run and Kimmorley floats the ball to Mad Dog who scores. Girdler converts (no surprise there); NSW 50-10. Amid the carnage, Gorden Tallis is caught smiling by the Channel Nine cameras... interesting, it's 50-10 and he's happy? Two Cane Toads who are most definitely not happy are Queensland commentators Paul Vautin & Wally Lewis. At 50-10 Fatty asked the King if he'd brought some boots with him... because it was time to put them on and get out there. We get a little bit of biff when David Furner resents some treatment in a tackle from Shane Webcke and it's for young and old. Furner gets the TKO after his punch sends Webcke to the turf. In the 77th Minute - Queensland finally stem the tide with a try to Gorden Tallis off a nice face ball from Adrian Lam across Martin Lang. Johns tries valiantly to stop him but Tallis gets over. Rogers converts; NSW 50-16. In the 80th Minute - NSW cap off a remarkable performance as Matt Gidley gets the final try of the game in the last minute. It's another doozy of a NSW Team Try - Kimmorley to Johns to Fittler to Girdler to Johns to... well you lose track it goes through so many sets of hands. In the end Gidley goes over in the right corner and to ice a monster game - Ryan Girdler slots it from touch. NSW 56-16. New South Wales sweep the 2000 State of Origin Series 3-0 with the 56-16 victory and the Blues dominate like we've never seen before. Brad Fittler, Andrew Johns & Brett Kimmorley steer the ship to a record win at Origin Level. Game Highlights... State of Origin Memory #2 - Slaughter at Stadium Australia. If anyone knows where to find this game on YouTube or another embeddable player - please contact me. 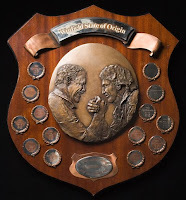 New South Wales v Queensland, Game Three, 2000 State of Origin Series. Ryan Girdler… had a night and a State of Origin Series that may never be repeated. He scored 32 points (3 Tries & 10 Goals) in Game 3 to go with 8 points in Game 1 (1 Try & 2 Goals) and 12 points in Game 2 (1 Try & 4 Goals) - for a total of 52 points in the series. He broke just about every State of Origin Points-related record in the process. He would go onto win a premiership in 2003 with the Penrith Panthers but this was the night when he wrote his name into Rugby League folklore. Ryan GIRDLER 3, Matthew GIDLEY 2, Adam MUIR, Andrew JOHNS, Bryan FLETCHER, Adam MacDOUGALL Tries; Ryan GIRDLER 10/10 Goals. Mat ROGERS, Darren SMITH, Gorden TALLIS Tries; Mat ROGERS 2/3 Goals. @ Stadium Australia, June 7, 2000. Official Man of the Match: Ryan Girdler, NSW. What’s your fondest or painful State of Origin Memory? We want to hear your story – contact us at wdnicolson.blogspot.com , wdnicolson@optusnet.com.au or via The NRL Tweet. Just 2 sleeps til Origin One. For wdnicolson.blogspot.com's full coverage of the 2010 State of Origin Series bookmark this link. Yeah but it's not 56-16 is it? I mean 28 points is good and all... 34 is impressive. But 56 - that's just ridiculous.